All products sold on houseofgrafx.com and our eBay store are CUSTOM graphics (which are NOT returnable or exchangeable). Please understand by ordering on our website you are agreeing to our return policy. Once your grafx have been cut (to your color selection &/or size) no changes to your order can be made. Should the error be on our part we will gladly replace the incorrect item at no additonal charge. Thank you for your understanding. -Color samples are also available on our website to further ensure your satisfaction. Should you choose to purchase the optional shipping insurance during checkout, your package is covered while in transit. If your item is lost, stolen (wrongly delivered) or damaged in transit you are covered! We HIGHLY recommend adding insurance to all orders for your protection. Once your package is in the hands of the post office we no longer have any control over delivery, transit time, damage to your item etc. Please be aware should you decline insurance during checkout we cannot help if you have an issue with your package during transit! WHICH BRAND OF MATERIAL IS USED? We use Oracal 651 series Intermediate Cal vinyl. This is a 2.5 mil film with a 6 year durability (depending on the installation). Resistant to most oils and greases, weak acids, salts and alkalis. Vinyl has a Permanent adhesive. Special proprietary formulation ensures optimized stability and resistance to UV degradation. *Please understand the lifespan of the vinyl (no matter the brand) is only as good as the installation. Grafx installed without using the proper surface preperation and drying time will not last as long as those installed correctly! Of course. We can make just about anything you need/want and we can also customize what we already have for sale. Graphics can be made smaller, or lager. Larger sizes will cost extra. We can add text, logos, shapes etc. You tell us (or show us) what you want, we create it. Simple as that. ARE GRAFX EASY TO INSTALL? If you're familiar with installing vinyl, and have patience, your grafx will turn out well. View our install instructions page prior to beginning installation. It's always nice to have another person to help when applying larger graphics and rally stripes. SHOULD I APPLY WAX OR POLISH TO MY NEW STRIPES/GRAFX? No. Oracal does not recommend using wax on their vinyl materials. Waxes have been known to draw out the plasticizers from the material which will dry the material and allow the material to break down sooner. Plasticizers bond the materials in the vinyl together. WILL THEY DAMAGE THE PAINT? As long as your paint is in good condition before the install, you shouldn't have any issues. A lot of customers change their grafx often for a new look or to change their color scheme. Any residue left by the vinyl is easily removed with regular rubbing alcohol. Our decals can easily be removed. You may need to heat them up with a blow dryer to soften them up making removal a bit easier. The graphics are considered permanent since they are manufactured and tested to last for several years in harsh elements, but they can be removed at any time. Once removed they cannot be re-used. DO GRAFX NEED PROFESSIONAL INSTALLATION? We highly recommend a professional install if you're not familiar installing vinyl (especially larger items & rally stripes). There are thousands of professional graphics installers located throughout the United States. 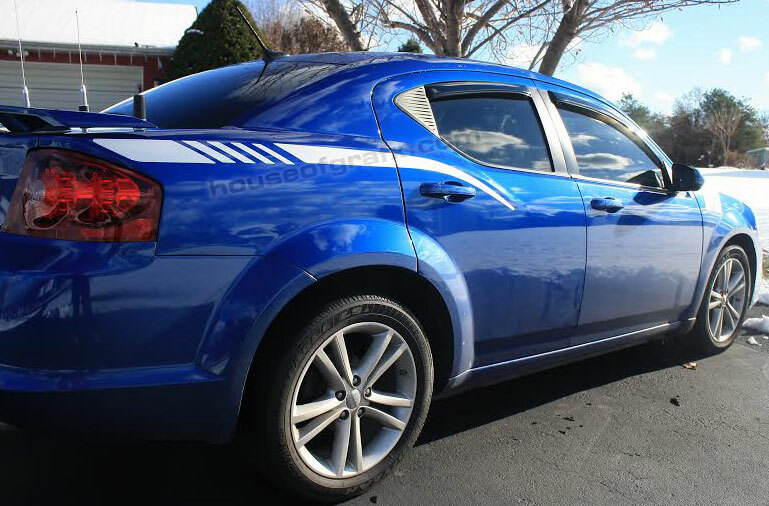 Tint shops will usually install the kit for a minimal fee. We are not responsible for improper installation nor is the installation included in the price. We are NOT held responsible for application errors, but will supply a replacement decal at a discounted price should you need one! DO YOU HAVE OTHER COLORS BESIDES THE ONES ON THE COLOR CHART? Yes. Additional colors and special color orders are available, for an additional fee. Check out our color chart to see what colors we stock. Should you want a different color simply contact us for pricing. CAN WE MAKE CUSTOM GRAFX? YES!!! We have hundreds of thousands of designs. Just because you don't see it doesn't mean we do not have it, or cannot create it. We have so many graphics that we would never be able to list them all =). Along with the ability to customize every single decal. It's impossible to put every single thing on the site. If you have a picture of what you want, or saw it elsewhere, email us. I'm sure we either have it or can make it for you at a better price. Email us. WHY ARE SOME STRIPE KITS OFFERED WITH TRANSFER TAPE & OTHERS WITHOUT? Some people like to install kits with the transfer tape (pre-mask) and some like to install without. We have install videos showing both ways to install. The transfer tape (pre-mask) keeps everything perfectly aligned and helps the kit retain its shape on the vehicle. When we install rally stripes (without pin stripes) we work without the transfer tape. Since it's up to the installers preference we give the option to have it applied or not. WHICH METHOD SHOULD I USE WHEN INSTALLING MY GRAFX? If you're not sure, email us. We will let you know how we install that particular decal. All decals/grafx can be installed both wet & dry, but it is safer to install larger decals using the wet method. Decals with fine lines or small text should be applied DRY! The wet method allows you to move/slide the graphic around before it sticks permanently. Be sure if you use the wet method you only use 1 drop of soap (if you choose to use soap). When we install, we use plain water, and lots of it. For your safety & convenience, we use PayPal to allow you to make purchases with your MasterCard, Visa or American Express using a secure connection. Feel confident knowing that PayPal is used by well-known companies such as Ebay. If you want to pay with a credit card, follow the steps towards paypal during the checkout. You will be prompted to enter your credit card information. If you do not have a PayPal account, or feel safer sending in a money order, that is fine! We will only accept Postal money orders (which are money orders from any post office within the USA). All others will be returned. Please include a copy of your order as well so we know what the payment is for. We do not accept personal checks.